Comparing Apples to BMWs: What Does it Mean to be a “Best Bookstore” Anyway? Flavorwire’s list of the Top Ten Bookstores in the US was not supposed to piss me off, but that’s exactly what it did. It was supposed to be the sort of article you read and then forget about until someone else runs it again next year. Instead, being the disagreeable sort, I found myself dwelling on the thing and, well, getting pissed off. The list angered me for several reasons. For one thing, it began with the obligatory opening gambit, “Bookstores are dying.” This is the default commentary-of-the-moment regarding bookstores (independent or otherwise). It follows from the idea that bookstores, like record stores, will be a thing of the past before you have time to finish Jonathan Franzen’s Freedom. Of course, this line of reasoning assumes that books are just like CDs and that record stores are, indeed, gone. Though neither of these statements is true, I will concede that bookstores are somewhat imperiled at the moment. Okay, maybe there are fewer bookstores in existence now than there were ten or twenty years ago, but to say that bookstores are dying is an oversimplification. It’s not so much that they’re all dying, but that a certain kind of bookstore is on its way out. The closure of the Lincoln Center Barnes & Noble, a superstore, for instance, represents the shifting tide in the book retail world. That store opened in 1995, and as we all know by now, a lot has changed in the media business since then. The days of requiring a 60,000 square foot storefront to sell books are coming to an end, if they aren’t already over. Make no mistake, the B&N closure was an epoch-defining one, even if it was a rent hike that made it happen. The superstore made a lot of sense in the pre-internet era. In order to offer the largest possible selection, you needed a lot of space. Initially, independent stores like Powell’s in Portland, Oregon and The Tattered Cover in Denver opened huge storefronts carrying tens of thousands of titles. The chain stores – especially Barnes & Noble – mimicked the open space, the big comfy chairs, and the air of bookish intellect of these stores. They took the concept of the superstore national, and in the process, they leveraged their size, scale, and efficiency to secure favorable deals from distributors. In short, they were able to sell books for less, which enabled them to sell more books. But Amazon and the rest of the ecommerce stores made the issue of selection and scale largely moot. How do you compete with a store that claims to offer every book in print? Still, having a physical location with a lot of books was valuable; if someone wanted the book that day, these stores were there for them, and they offered a large enough selection to satisfy all but the most esoteric needs. But what would happen to these stores if the need for the physical book were suddenly removed? With the rising popularity of ebooks – set to consume anywhere from 15% to 50% of the book market in the next five years, depending on who you believe – we are about to find out the answer to that question. Barnes & Noble and Borders both know first-hand what it’s like to be suddenly left with a product that no one needs. In the 1990s and early 2000s, both dedicated significant floor space to CDs and DVDs. The book industry even had a term for this – “sidelines,” a term they later revised to the much catchier “non-book products.” But digitization and the internet came quickly for CDs, gutting that business in just a few years. As broadband speeds increase, streaming video will eventually kill off the DVD, as well. In response, the big stores turned to products that couldn’t be so easily digitized. Almost every big store now has a cafe, creating a “third place” where people could congregate and discuss the books and periodicals they’ve purchased. Many stores have converted an area into a permanent events section, giving them a seating capacity that rivals some small theaters and attracting big name authors for readings and parties. A few weeks ago, Borders announced it will be selling custom-made teddy bears in its stores. But despite their best efforts, the large stores face a daunting and dismal future. Hence the elegiac mood of the Flavorwire piece, and its imploring “buy some books, you lousy ingrates” call to action. Another pet peeve of mine is when people consider their local independent bookstore a charity. Unless your store is a non-profit, it should succeed or fail based on how well it does as a business, not because of noblesse oblige on the part of your municipality. Allowing people to treat your for-profit business like a charity can have some unwanted side-effects. I’ve worked for stores that would occasionally charge admission to a reading. Typically, the price was purchasing a copy of the book, which seemed perfectly reasonable to me – you’re there to see the author, you buy the book, the store makes some money, the author makes some money, everybody wins! But all too often, people would look at me as if I’d just told them air was no longer free. “You shouldn’t be charging for these events,” they’d say. “They’re good for the community.” In other words, they were looking for an evening of free entertainment. Well, this isn’t the library, ma’am. We have to pay the bills somehow. 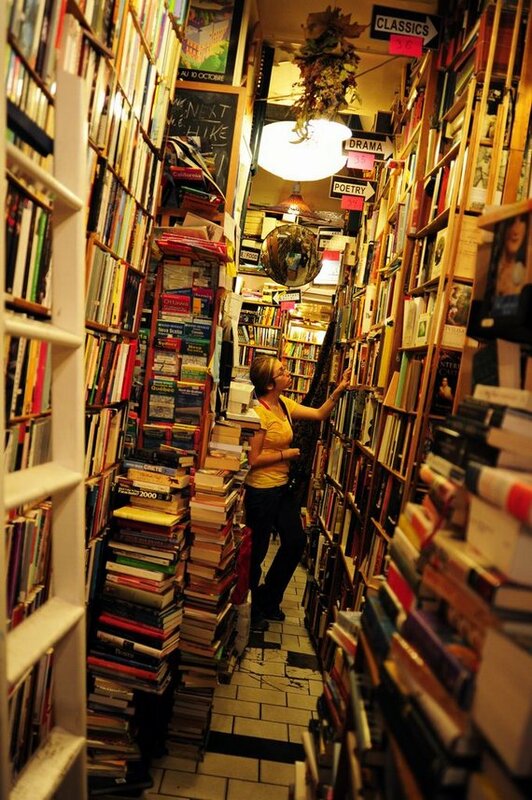 But despite all of this, there are some reasons to be excited about bookstores. The Flavorwire article came to my attention because of the efforts of two New York City independent bookstores – Housing Works and McNally-Jackson – who had posted the article to their Tumblr blogs. Housing Works pointed out that most of the best indie bookstores in New York had opened in the last ten years, not closed. They were talking about Greenlight Bookstore, WORD, McNally-Jackson, Idlewild, Powerhouse, and Desert Island. In Los Angeles, where we’ve had some substantial bookstore attrition in recent years, several new stores have opened, including Metropolis, Family, Stories, The Secret Headquarters, and the Brentwood Diesel store. On top of that, Vroman’s Bookstore, my former employer, was doing enough business to buy fellow LA indie outpost Book Soup (also a former employer) and Skylight Bookstore expanded, annexing a neighboring storefront. These stores are succeeding not because they are the biggest stores, but because they are the right stores for their areas. We’re seeing a resurgence of the neighborhood bookstore, something many had considered dead in the heyday of the super stores. Technology has actually leveled the playing field between big stores and small stores; anyone with enough capital and the space for a large copy machine can have a Book Espresso Machine, giving them access to hundreds of thousands of titles, as well as custom-printed books. And web applications like Foursquare and Facebook Locations don’t discriminate between businesses based on size; anybody with a good hook can lure people to their store and capitalize. Which brings me to the second thing I hated about the Flavorwire piece: What does it mean to say “These are the best bookstores,” after all? Any list that includes Powell’s, The Strand (a store that sells mostly remainders and used books), and Secret Headquarters is comparing apples to BMWs to gym memberships. Making a list like this is akin to asking, “What’s the best place to buy food in Los Angeles?” and then listing Whole Foods, The Cheese Store of Silver Lake, and Animal as your answer. Sure they all sell prosciutto, but that’s more or less where the similarities end. Please don’t think the stores on Flavorwire’s list aren’t great – they are – but the stores they chose reveal the futility of the whole process. What makes a “great bookstore” and what do the stores on the list have in common with one another, other than that they all sell books? The truth is, I can teach you to write a “Best Bookstore” list right now. Nearly every “Best Bookstore” list pulls five or six stores from the following list of venerable indies: Powell’s, Tattered Cover, Vroman’s, Book People (in Austin, TX), Elliott Bay (Seattle, WA), and Books and Books (South Florida, the Cayman Islands & now Long Island). Those are the remaining indie super stores, and they rightly deserve praise, but there are so many tremendous smaller stores that are equally deserving of recognition. There are too many, in fact, to make a list (Believe me, I tried). And what makes so many of these stores incredible, what many of the chain stores could never mimic, is the staff. A better list might be one that names the top 10 booksellers in America (I could take a crack at that: Stephanie Anderson from WORD, Emily Pullen from Skylight, Michele Filgate from Riverrun, Rachel Fershleiser from Housing Works…Well, I could go on). In the end, it’s irrelevant, as the only bookstore that anybody cares about is the one near them, the one whose staff knows their tastes, the one that hosts your favorite author when he or she comes to town. For some of you, that’s no doubt a chain store. I grew up outside Syracuse, NY, and I will absolutely shed a tear the day the Borders in the Carousel Center Mall closes, as it was place I remember visiting when I was in high school and just discovering the pleasure of reading. The rest of the stores, though – the big, nationally known bookstores – exist for you, unless you live around the corner from one of them, more as monuments than as businesses. They’re kind of like those iconic bars and restaurants that people make a point of stopping at every time they’re in New York or LA – they’re the McSorley’s or the Musso & Frank’s or the Rendezvous of bookstores. If they went away, you’d read about it in the paper. It would be an “important moment,” but its impact on your life would be minimal unless they are your store. It’s the proverbial store around the corner that you care about, and if that store continues to serve you well, I think it will survive. If it doesn’t, well, hopefully someone will put it on some sort of “best of” list before it goes. Now, if you’ll excuse me, I’m off to celebrate the fact that my local bookstore is still kicking. Maybe you should do the same. There is a real window of interest when people want to know something. . . . And that window slams shut pretty quickly in the media cycle. Opining is fun, and so is ideological combat. But a book is, or should be, something different: A chance to slow down. An opportunity to raise one’s sights a little higher. . . . To reflect instead of react. What Beast Books is proposing . . . is (in Truman Capote’s words) the reduction of writing to typing. Presumably, this is just the sort of “something” that might merit book-length treatment…were the whole subject not so last week. Amazon isn’t content just to get your online shopping dollars. Now it wants to travel with you, untethered. Amazon’s recently unveiled TextBuyIt lets you buy stuff from the online store with a few keystrokes on any old mobile phone.The implications here are interesting. Shopping by text message seems clunky, especially in the age of the iPhone, but my guess is that Amazon is trying to build the mobile shopping habit for when everybody has iPhone-caliber browsing abilities at their fingertips. This era likely isn’t far off. This means that folks will be able to walk around their local Barnes & Noble or Best Buy, handle the goods, and then punch up a purchase with Amazon at a better price.Certainly mobile shopping may represent yet another threat to brick and mortar book retailers, but I suspect the companies that should be really nervous are electronics chains, where the potential savings to be had are much greater. Good bookstores will always be able to offer a pleasant atmosphere and knowledgeable staff that Amazon is unable to match. This is the truth. Thank you for an astute blog. I liked that the Flavorwire piece introduced me to bookstores I hadn’t heard of, but it’s a good illustration of the sheer impossibility of coming up with coherent “best of” lists. I agree—apples to BMWs to gym memberships. It’s all so relative. The best bookstore was the one I worked at, Aspidistra in Chicago (RIP), though many in my area love Myopic in Wicker Park. I really hate that place (they have this ridiculous rule about restocking books as you browse and raise each book a dollar if they find it mis-shelved). How to win this debate? Uh, why bother… as you say, I’d sooner go to the Seminary Coop and celebrate its continued, glorious existence. Bryan Gilmer of Durham, N.C., teaches newswriting at the University of North Carolina at Chapel Hill and writes for institutional and corporate clients. Until 2003, he was a reporter at Florida’s largest newspaper, the St. Petersburg Times. He has just independently published a crime thriller novel, Felonious Jazz.Last week, I created a Kindle version of my indie crime thriller novel, Felonious Jazz, using the tools at Amazon’s Digital Text Platform. It took about nine minutes, a “why-not” side project alongside my trade paperback, which I published using Amazon’s print-on-demand company, CreateSpace.My Kindle edition went live last Monday at $7.99, so I announced it on a couple of Kindle message boards online. By Wednesday, I’d sold one copy. One! Message board replies said, “If you want us to try a new author, give us a really low price. It’ll generate sales and reviews.” So I marked it down to $1.99 Thursday morning and posted the price change on the same boards. What happened next was remarkable:As of 5 p.m. Friday – about 36 hours later – Felonious Jazz was the No. 1 selling hard-boiled mystery on the Amazon Kindle Store and the 17th best-selling title in Mysteries & Thrillers – the only title not by huge names like John Sandford, Michael Connelly, and Elmore Leonard in the top 25. Its overall Kindle sales rank was as high as 133rd out of all the 283,000+ fiction and non-fiction titles available in the Kindle Store.I thought, now that I’m in the rankings, I shouldn’t have to be so cheap. I bumped the price to $4.99. Sales continued, but at a slower pace, (and Felonious Jazz has slipped in the rankings. I probably should have stuck with $1.99 longer). I also drew in some people who just buy cheap Kindle offerings who don’t normally read the genre, though they may have been less likely to enjoy it than fans of similar books.But overall, what a no-budget way to gain visibility. A few big lessons here: Readers expect Kindle books to be much cheaper than dead-tree books (because they know it costs less to publish them and they can’t share them and worry they won’t have them forever). A cheap price is enough to buy your way up the rankings among national names with a zero-dollar PR campaign. Now that there’s a free Kindle app for iPhone, the potential audience for a Kindle title is not just the half million people who spent $359 for the device but many times that large. It’s surprisingly comfortable to read book text on the Kindle iPhone app. If you haven’t tried it yet, get the app and grab my free sample from Amazon, and you’ll see what I mean. It’s transformative to have a book you’re reading (or several) on your phone to pull out whenever you have to wait in line or for an appointment.More worrying for conventional publishers is that Kindle board posters don’t think big publishers are pricing their titles cheaply enough, and when prices get above $9.99 they get angry about it. I’m not sure whether the high prices are due to higher costs, more parties to share the revenue with, or the fear of cannibalization of paper-copy sales. (But the advantages! Near-zero production costs. No warehousing. No shipping. No returns. New edition at any moment. Never out of print. And the Kindle makes people read and buy more titles.) Could big publishers go from being at a tremendous advantage to competing for top-25 sales rankings – if not profits – with a guy in his home office? Will a Netflix-like company launch without the expensive legacy infrastructure of the big New York houses and take advantage of elasticity of demand at much lower price points? As I type this I realize – maybe that’s Amazon.A bad side effect is that without barriers to entry, a lot of non-professional-quality content creates clutter. But to some degree, crowd sorting (via online reviews and such) can cope with that. After three years of wrangling, Google is pushing closer to a digitized future for books. Even as the U.S. Justice Department continues to review a newly released, modified version of a settlement with groups representing authors and publishers, Google’s plans still contain within them the blueprint for a seismic shift in how we consume and interact with books. Meanwhile, in the newest version of the settlement, the central elements of Google’s digitization plan are mostly unchanged from a year ago when the settlement was initially announced. We outlined a year ago what is most likely to matter to readers, a massive expansion in the access to books still under copyright, but out-of-print, including the so-called orphan works. Google’s plan paves the way for a huge expansion in the access to this massive class of books — 80% of the books in libraries, according to Google. More important, however, is how these books will be made available. As Google has outlined in its breakdown of the new agreement, “Once this agreement has been approved, you’ll be able to purchase full online access to millions of books. This means you can read an entire book from any Internet-connected computer, simply by logging in to your Book Search account, and it will remain on your electronic bookshelf, so you can come back and access it whenever you want in the future.” This means that millions of books that were once available only in library stacks or through used book dealers or, more likely, that were essentially invisible to all but the most motivated buyers and researchers, will suddenly be as ubiquitous and easily accessible as Google itself. It is hard to overstate how big this change could be. You might liken it to the creation of the internet itself, when a critical mass of interconnections gave rise to the sharing and spread of information on a massive scale. Even as the internet has changed how we think about the accessibility of knowledge and data, a massive, “dark” cache of human knowledge has remained largely untouched, many millions of physical volumes whose copyright status doomed them to the analog world. With a finalized settlement, these volumes will become plugged into the internet as we know it, available for purchase, and accessible to anyone with an internet connection and a willingness to pay. The ripple effects of this development may be hard to predict, but it seems likely to bring further into the mainstream the notion of buying a digitized, format-agnostic book. The impact of this will be amplified by the recent news that Google will not be the only seller of the books it has scanned. As a Publishers Marketplace overview of the newest version of the settlement points out, “any book retailer — Amazon, Barnes & Noble, local bookstores, or other retailers — will be able to sell consumers online access to the out-of-print books covered by the settlement.” In this way, the settlement heralds a whole new category of books being sold by book retailers. Meanwhile, the settlement has been scaled back in one significant way from a year ago. It will only apply to books published or copyrighted in the U.S., U.K., Australia, or Canada. The legal intricacies of including books from other countries apparently proved too challenging to overcome. But ultimately, at least for the English-speaking world, this reining in of Google’s effort will hardly limit its potential consequences.